This index contains a comprehensive listing of more than 20.000 Japanese swordsmiths, from the early days right down to modern times, i.e. from kotô to shinsakutô. It is not simply a list of names, it also provides biographical information according to the extent of a smith´s fame. Aim is to give the reader a coherent picture of a certain smith, that means his civilian name, how did he sign, in which style did he work, and who was his master or his school environment. Thereby, the most common theories on a smith are included and discrepancies in the transmissions are pointed out. This work is a revised and completely new recorded list of smiths by incorporating all relevant Japanese and non-Japanese sources. Incorrect entries and double listings were deleted and readings corrected. The smiths are listed in alphabetical order and sorted according to their used characters. A list of all characters used in the names of the smiths in this index is available, sorted by stroke order, so that the search of a smith with an unknown reading is also possible. 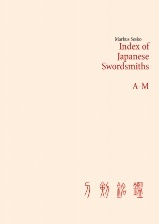 Do you have a bookseller in the United States for the English version of Index of Japanese Swordsmiths A-M? I would like to get a copy. thanks!